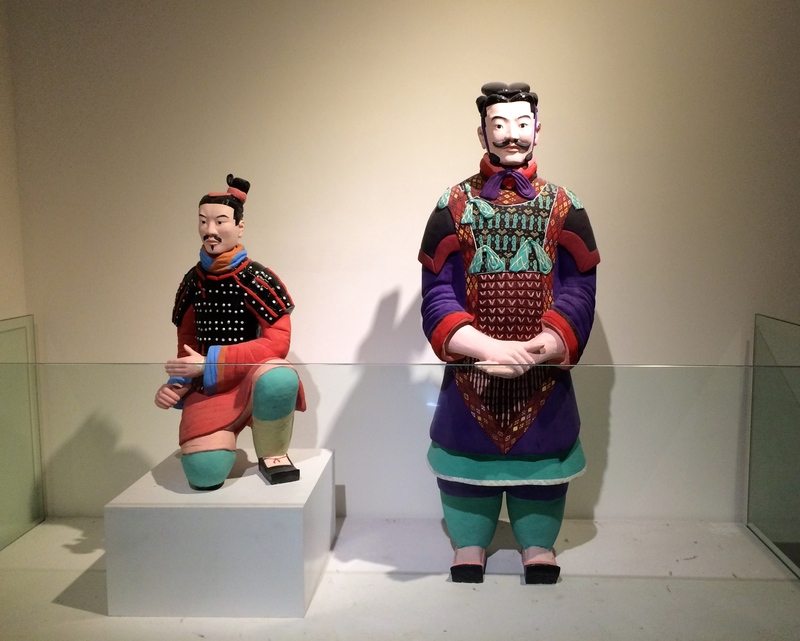 Zack D asks: Is it true that the terracotta army soldiers are all unique? More than two thousand years ago, the man who unified China, established a single system of writing and currency, and began construction of the Great Wall, ordered that a 20 square mile underground city, to be later filled with the finest treasures and protected by thousands of clay soldiers, be built for his tomb. 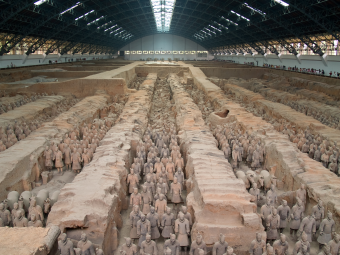 After his death and interment, its location was ultimately lost to history, and Qin Shi Huang’s fabulous mausoleum lay undetected under a man-made mountain for about two millennia, until it was discovered by chance about four decades ago. Qin Shi Huang ascended to the throne of the Kingdom of Qin at the age of 13 (@ 246 BC), at a time when China consisted of seven warring states (Qin, Han, Wei, Chu, Zhao, Yan and Qi). Already concerned with his legacy, the man who would eventually be known as the First Emperor (after he conquered each of the other states), commissioned his tomb, to be outfitted with everything he would need for the afterlife. After consulting with his geomancers, the foot of Mount Li, in the northwest of Xi’an in Shaanxi Province, was chosen and work began. Accelerating with each victory over another warring state, by the time he was proclaimed the Emperor of Ten Thousand Generations in 221 BC, reportedly 700,000 people were engaged in building the mausoleum and creating its contents. Designed as a scale model of his royal palace, at its heart was a square tomb chamber with a bronze covered outer coffin in the center. This was surrounded by a succession of rectangular chambers, all to house his royal court on the First Emperor’s journey to the afterlife. Replicas of palaces, scenic towers, and the hundred officials, as well as rare utensils and wonderful objects, were brought to fill up the tomb. Craftsmen were ordered to set up crossbows and arrows, rigged so they would immediately shoot down anyone attempting to break in. Mercury was used to fashion imitations of the hundred rivers . . . . Above were representations of all the heavenly bodies, below the features of the earth . . . . The entire tomb was topped with a man-made mountain, Lishan, which was planted with trees and other vegetation. Once these builders reported to the Second Emperor that the burial was completed, they were also (supposedly) killed. Whether that’s really how it went, eventually the First Emperor’s tomb was lost to history. Then, in 1974, while digging a well near the mausoleum’s eastern wall, three peasants from the village of Yangeun-West discovered Pit 1 – an area of the complex housing what is today believed to be 6,000 effigies of the ancient Chinese warriors who guarded Qin Shi Huang. Building on this, archaeologists from Emperor Qin Shi Huang’s Mausoleum Site Museum and University College London used cutting edge imaging technology to measure the clay ears of 30 terra cotta warriors, and determined that those on each figure were unique. Not as strange as it sounds, human ears are as distinct as fingerprints. So, taking digital pictures from a safe distance (the warriors are packed so closely together that there were concerns about trying to measure them manually without damaging them), the scholars created 3-D models of their left ears. From this, they determined that no two they looked at were alike. This, along with other such evidence supporting the notion, led them to conclude that the army was, in fact, an enormous series of portraits. For years, many scholars have opined that the construction of the army was done assembly-line style (like a Ford automobile plant), but a 2012 study has called that theory into question, at least with some of the artifacts. Examining the bronze weapons “carried” into the tomb by the warriors (tens of thousands of swords, spears, crossbows, lances and axes), archaeologists determined that they were actually made in numerous autonomous workshops where the artisans crafted the weapons from design to completion. No one knows precisely how many figures are in the entire complex as most of it has yet to be uncovered. 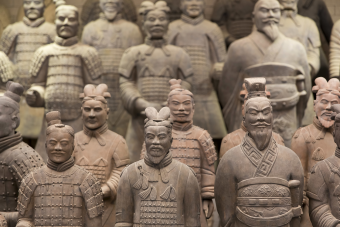 While more than 2,000 sculptures have been revealed so far (warriors, dignitaries, officers, acrobats, dancers, horses, carts and chariots), experts believe there are upwards of at least 6,000 more warriors alone still buried. And, it is likely that for the near future, they will remain so – as will the actual tomb of the First Emperor. This is because, although archaeological techniques have vastly improved over the past few decades, many believe they are still not up to the task of opening the Emperor’s tomb without unintentionally destroying some of its contents. Of course, the counterargument is often put forth that much information is gained, too, that would otherwise remain unknown if excavation isn’t moved forward.